WANT TO UNDERSTAND HOW HUMANS TRAVEL AND WHY? WANT TO SEE IF YOU CAN INFLUENCE TRAVEL BEHAVIOR AND INFLUENCE CLIMATE CHANGE? The Global Metropolitan Studies Program and the Division of Data Science are pleased to sponsor a workshop on a platform for collecting and analyzing such data. 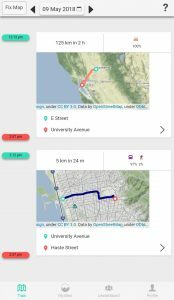 The workshop will introduce participants to e-mission, an open-source platform for collecting human travel data. The course is intended for students and researchers across a variety of fields. Attend this workshop to learn open source techniques, details about the e-mission platform, and brainstorm about enhancements to the system. Please RSVP here if you are planning to attend. Lunch will be provided. Remote attendance with asynchronous Q&A is also supported with pre-registration. In order to avoid spammers from taking over the Q&A, participation will be restricted to people who have registered. So please register even if participating remotely. K. Shankari is a Doctoral Candidate at the Department of Electrical Engineering and Computer Science (EECS) and the developer of the e-mission platform. Aug. 20th, morning session: background material: Help project leads become with basic CS/open source concepts so that they can point students in the right direction – e.g. what is a branch? what is a pull request? Aug. 20th evening session: e-mission overview: Help everybody become more familiar with the features of e-mission. what is the e-mission architecture? how do I change the UI? what does the data look like? hands-on setup of end-to-end system. Aug. 21st evening session: roadmap ahead: what is the long-term direction that we want the project to go in? what are the potential improvements, how do we prioritize them, and who gets to tackle them?